I phoned the dental office on May 26, 2009 regarding both upper elastic ligatures (on the anchor tooth) somehow came off, causing the archwire to lose tension. Every time I tried to snap the archwire into the brackets, it would pop right out. I was only able to speak to the receptionist. She put me on hold to consult the dentist. They didn’t offer an appointment to me unless the situation was causing me pain. I was a little annoyed at them but tried to stay calm. 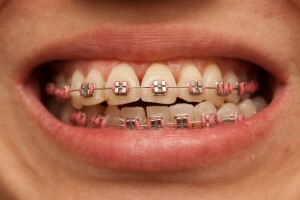 They advised me to hold the archwire down with ortho wax (which I tried without success before I called them). I figured one more week of waiting would be okay. This was a problem I failed to foresee when I decided to get my braces at this particular dental office. It’s horrible that their orthodontist only works out of that office twice a month on Thursdays only. A few days after the call, I had a similar problem with the lower archwire. At least this time, I could pop the archwire back in place. It was a little annoying that I had to do this several times a day. I was thankful that the archwire ends were not digging into my gums or mouth. Of course, when I had my follow-up appointment on June 4, I complained to Dr. B and his assistant. His assistant told me that I could have come in to see her for help and that she could have replaced the ligatures for me. Oh well, too late now, I thought. She was surprised that the receptionist gave me misinformation on what to do. Looks like the left and right hand aren’t speaking to each other. I can’t believe I’m the first patient to have experienced this issue? Too bad it’s something I couldn’t have replaced myself. It’s not the most convenient office for me to travel to. Otherwise, another routine visit. Dr. B has placed an ortho spring to help close the gap between two left lowers. I guess it’s suppose to push a tooth back. Whatever it takes to close the gap, I guess? I made a decision to stay away from the green elastic ligatures, since they were the only ones to cause me problems. By the time, this appointment rolled around, I had lost several of them. There were no problems with the other colors. Not sure if the green ones were defective in some way? This entry was posted on Monday, August 3rd, 2009 at 3:55 pm	and is filed under Angela, braces. You can follow any responses to this entry through the RSS 2.0 feed. You can leave a response, or trackback from your own site.